The big thing this year was the "Political Theory In/ And/ As Political Science conference. It was intellectually terrific and a lot of fun, and I think it may help catalyze some real change in the discipline. Lots of pictures of it here, including a number of the special reception we held to honor Jane Mansbridge being awarded the Skytte Prize. There will be publications and spinoffs and an ongoing workshop series to come; the first spinoff was a theme panel at APSA. Beyond that I have mostly been working on my next book, Justice in Babylon. "Political Libertarianism," in M. Todd Henderson, ed., The Cambridge Handbook of Classical Liberal Thought, Cambridge University Press. Johan de Beus Lecture, University of Amsterdam, November 19 2018: "Justice In Babylon." Saurman Distinguished Lecture, San Jose State University, February 28, 2018: "Black Liberty Matters." "Winning Isn't Everything," Niskanen, October 11, 2018. Reprinted in Salon. "Law and Border," Niskanen, July 25 2018. reprinted in Salon. September 7, 2018: Shawn Apel, CBC Radio Noon, On Steve Bannon, and the anonymous op-ed from within the Trump administration. [tap tap] Is this thing still on? In case anybody's still got this blog in their RSS feed who doesn't follow me on Twitter or Facebook or BHL, I might as well add a mention here: I have my first piece in the New York Times, on restoring democratic norms as a political strategy. It seems pretty unlikely that any of the 33 people who still subscribe to this blog via RSS are need to know this, or that if they need to, they don't already (am I FB friends will all 33 of you? ), but it seems like proper online ettiquette to post this: I have a new website at http://jacobtlevy.com. I'm finally giving up on the frames-based one that has kept the same basic structure, look, and base HTML code (which I wrote myself) since late 1996. At some point, even I recognize that unselfconscious retro becomes kitsch becomes the suspicion that I'm doing the equivalent of putting my CV on a geocities page. This 2002-era blog will stick around for occasional use, though. A few new reviews of RPF,, so I'm making a post here with the overall list that I can update from time to time. I was interviewed by Cato's Aaron Ross Powell and Trevor Burrus for the http://libertarianism.org podcast "Free Thoughts" about Rationalism, Pluralism, and Freedom. Our hourlong discussion is available as a podcast or online audio here. Another year, another round of elections to the American Academy of Arts and Sciences that includes no political theorists. I'm not sure any theorist has been elected from within political science in the past six years. (There have been people elected from within philosophy, history, or law who are also political theorists.) That also means another year in which Michael Walzer in particular hasn't been elected. In the empirical fields we're starting to see a generation change in the people who are elected: PhDs in the 1990s are starting to turn up. In political theory, I don't immediately see anyone with a PhD after 1980, and there are still conspicuous omissions that ought to be rectified from the generation before that. This seems a little too openly self-promotional for BHL, but: see Todd Seavey on my new book at his blog, and Melissa Schwartzberg at The New Rambler Review, a new review site edited by Adrian Vermeule, Blakeley Vermeule, and Eric Posner. I have some extra copies of books to which I contributed sitting around the office. Anthony Laden and David Owen, eds., Multiculturalism and Political Theory James Fleming and Jacob T. Levy, eds., NOMOS LV: Federalism and Subsidiarity Avigail Eisenberg and Jeff Spinner-Halev, eds., Minorities Within Minorities Will Kymlicka and Alan Patten eds., Language Rights and Political Theory Better to get them into the hands of people who will read them. 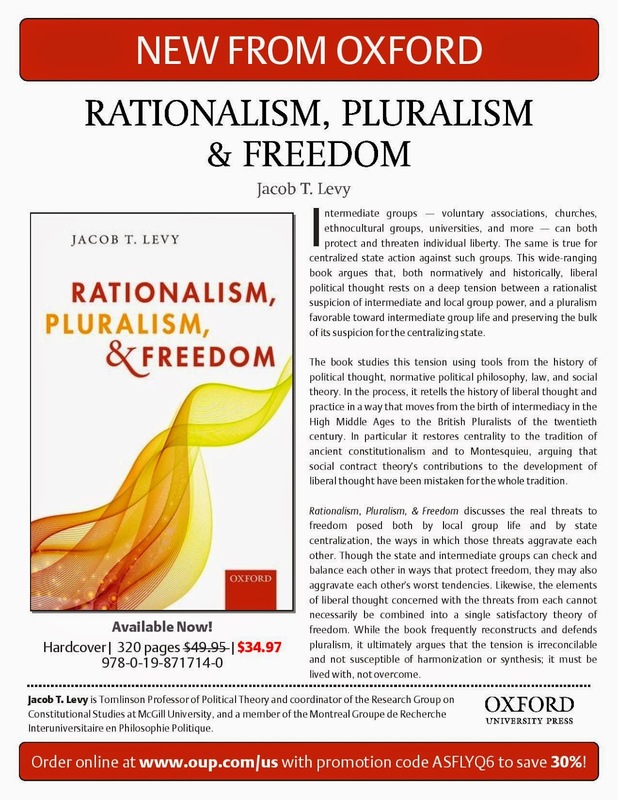 So: The first eight current students (or postdocs) who buy a copy of Rationalism, Pluralism, and Freedom after this post goes up, and who forward me their proof-of-purchase e-mail, can name one of the above books and I'll send it to them. (Actually, please name a first and a second choice in case there's clustering; I'll also update this post to indicate when each of the volumes runs out.) The cheapest way to buy RPF is directly from OUP: go here, and use discount code ASFLYQ6 at checkout for 30% off. For a while, at least, OUP was giving an additional 10% off to people making their first direct purchase through the website. If that's still true, then it comes to $US 30 or so. E-mail address is jtlevy [at] gmail.com . That means someone has pre-ordered Rationalism, Pluralism, and Freedom. Maybe even two someones. Over at BHL, I'm blogging my way through a round of reading the 2013 and 2014 Annual Reviews of Political Science this summer. Now in print: Nomos LV: Federalism and Subsidiarity (hardcover or electronic). "In Federalism and Subsidiarity, a distinguished interdisciplinary group of scholars in political science, law, and philosophy address the application and interaction of the concept of federalism within law and government. What are the best justifications for and conceptions of federalism? What are the most useful criteria for deciding what powers should be allocated to national governments and what powers reserved to state or provincial governments? What are the implications of the principle of subsidiarity for such questions? What should be the constitutional standing of cities in federations? Do we need to “remap” federalism to reckon with the emergence of translocal and transnational organizations with porous boundaries that are not reflected in traditional jurisdictional conceptions? Examining these questions and more, this latest installation in the NOMOS series sheds new light on the allocation of power within federations." The Research Group on Constitutional Studies at McGill University invites applications for a postdoctoral fellowship for academic year 2014-15, renewable for 2015-16. The Fellow will receive a stipend of $C 50,000 per year as well as a research fund and benefits. The Fellow will be expected to be in residence at McGill throughout the academic year, and to take an active part in workshops, conferences, and the intellectual life of RGCS and appropriate related research groups and centres (for political theorists, the Groupe de Recherche Interuniversitaire en Philosophie Politique, GRIPP). The Fellow will also be expected to teach one course per year, most likely an upper-level undergraduate course on "Philosophy, Economics, and Society," though other matches between curricular needs and the Fellow's interests are possible. The competition has a preference for political theorists, but is also open to those whose research in comparative politics or the public law field of political science falls within the theme of constitutional studies: constitutional design, constitutional law, and the operation of constitutional-level political institutions. Applicants should send a cover letter, CV, research statement (including a plan of the work to be pursued in the next two years), one writing sample of no more than 10,000 words, to RGCS.McGill@gmail.com by June 20, 2014, and should arrange for 2-3 letters of recommendation to be sent to the same address. It is helpful and welcome if the cover letter specifies one or more political science members of RGCS' faculty roster ( http://www.mcgill.ca/rgcs/faculty ) who might be most appropriate as a research advisor, but the final match with an advisor or advisors may differ. The competition is open with respect to nationality; knowledge of French is an advantage but not required. Other information on postdoctoral fellowships at McGill is available at http://www.mcgill.ca/gps/postdocs/fellows , including information on obtaining a Canadian work permit if necessary. Ph.D. must have been awarded between January 1, 2010 and the date of application, or else the dissertation must have been successfully defended and all requirements for the degree completed by the date of application (i.e. with formal awarding of the degree still pending). All e-mailed parts of an application including letters of recommendation should include the applicant's name in the subject line. Applications submitted as one complete interfolio file are welcome. "Civic Freedom in an Age of Diversity: James Tully's Public Philosophy"
"Ethical Dimensions of Monetary Policy"
For 2014-2015, we seek up to three new post doctoral fellows. We welcome candidates with substantial normative research interests from philosophy, the social sciences, and the professional schools. We are especially interested in candidates with research interests in inequality, education, international justice, and environmental ethics, but we welcome all applicants with strong normative interests that have some practical implications. Scholars with a JD but no PhD are eligible to apply. Fellows will be involved in teaching, interact with undergraduates in the Ethics in Society Honors Program and help in fostering an inter-disciplinary ethics community across the campus. The appointment term is September 1, 2014 - August 31, 2015; however, the initial term may be renewed for an additional year. Applicants must have completed all requirements for their PhD by June 30, 2014. Candidates must also be no more than 3 years from the awarding of their degree (i.e., September 2011). The application deadline is January 9, 2014 (5:00pm Pacific Standard Time). Stanford University is an equal opportunity employer and is committed to increasing the diversity of its faculty. We welcome applications from women and members of minority groups, as well as others who would bring additional dimensions to the university's research and teaching missions. Salary is competitive. Please submit a CV, a writing sample (no more than 25 pages), three letters of recommendation, and a one-page research statement. For information on how to access the online system to submit your application material, visit our website https://ethicsinsociety.stanford.edu/postdoc-fellows/application-process. Contact person: Anne Newman arnewman@stanford.edu. ~~~~~~~~~~~~~~~~~~ The Center for Ethics in Society Post Doctoral TEACHING Fellowships For 2014-2015, we seek up to two new post doctoral teaching fellows. These teaching fellows are offered in conjunction with Stanford's new general education requirement, which requires all Stanford undergraduates to take at least one ethics course. Teaching fellows will assist in one class per quarter and will be asked to run up to two sections per quarter. The Ethics Teaching Fellows will be fully integrated into the programming of the Center. This fellowship provides an opportunity to work with great students in a variety of disciplines and develop ethics expertise across the curriculum. The appointment term is September 1, 2014 - August 31, 2015. Applicants must have completed all requirements for their PhD by June 30, 2014. Candidates must also be no more than 3 years from the awarding of their degree (i.e., September 2011). The application deadline is January 9, 2014 (5:00pm Pacific Standard Time). Stanford University is an equal opportunity employer and is committed to increasing the diversity of its faculty. We welcome applications from women and members of minority groups, as well as others who would bring additional dimensions to the university's research and teaching missions. Salary is competitive. Please submit a CV, a writing sample (no more than 25 pages), three letters of recommendation, and a teaching portfolio. For information on how to access the online system to submit your application, visit our website https://ethicsinsociety.stanford.edu/postdoc-fellows/application-process. Contact person: Anne Newman arnewman@stanford.edu. Religious institutionalism conference at DePaul. I think I should adopt "small but stubborn" as my personal motto, to be emblazoned on the home page of the blog, my business cards, and eventually the coat of arms of my Game of Thrones-style noble house. It works, donchathink? Zimmerman. 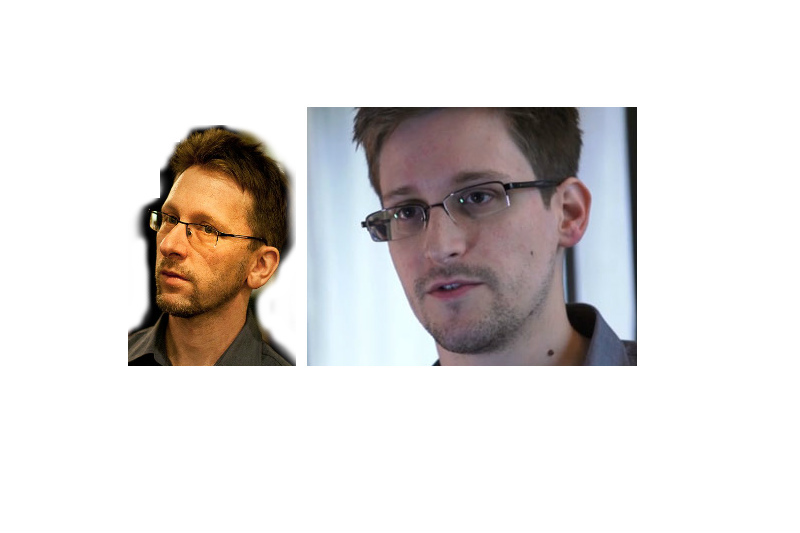 Snowden. Dhaka. Taksim Square. Tahrir Square. Lac-Megantic. Oklahoma tornadoes. West, Texas. Syria. This is starting to feel like one of those novelistically awful long-hot-summers.... as if it's building up toward a blackout-riot on a global scale, or to the revelation that the neighbor's demon-possessed dog has been orchestrating the whole thing, or to a wrath-of-god thunderstorm in which Batman returns after ten years of retirement. This seems like an appropriate summer for Superman to start snapping people's necks. In the novel that's set in this summer, Jenny McCarthy, Anthony Weiner Colin McGinn, and Elliot Spitzer will provide the dark comic relief--bad, and in some sense too bad to be funny, but not immediately* fatal, and so implausibly ridiculous that they let you laugh for a few pages in between the long stretches of tension. *Yes, giving Jenny McCarthy a platform for her views will lead to more deaths. I said "immediately."